Here is the history of the disintegration of the Russian Empire, and the emergence, on its ruins, of a multinational Communist state. In this revealing account, Richard Pipes tells how the Communists exploited the new nationalism of the peoples of the Ukraine, Belorussia, the Caucasus, Central Asia, and the Volga–Ural area—first to seize power and then to expand into the borderlands. The Formation of the Soviet Union acquires special relevance in the post-Soviet era, when the ethnic groups described in the book once again reclaimed their independence, this time apparently for good. 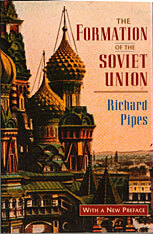 In a 1996 Preface to the Revised Edition, Pipes suggests how material recently released from the Russian archives might supplement his account.